Typefaces that are on an angle are called italic. This includes simple obliqued letters as well as designs that mimic cursive writing. Originally, italic letters were not designed to complement a Roman typeface. 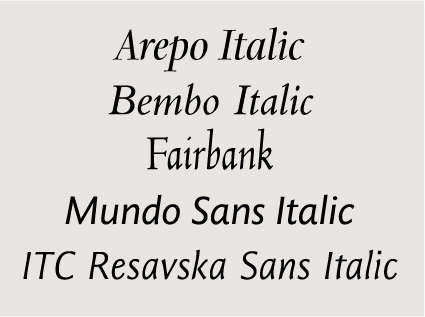 When introduced in the early 16th century, they were created as independent fonts. Each italic design was a single-weight family, containing only lowercase characters: no caps, no numbers, no punctuation. The practice was to use capitals and any other characters needed from whatever Roman font the printer had available. It wasn’t until the 17th century that italics became a legitimate part of a type family, with slanted caps and numbers created as part of the offering. It’s interesting to note that ITC Novarese, a typeface that has caused designer confusion since its release because of its lack of italic capital letters, is really a modern interpretation of the traditional italic genre. Italic designs based on classic handwriting are generally called cursives, and have a script-like quality. Cursive designs tend to be confined to serif and humanist sans serif typestyles. Obliques appear to be just slanted versions of Roman letters. They are usually the italic designs of sans serif typefaces. In rare instances, they are no more than electronically-slanted Roman characters. Aldus Manutius’ italic type evolved from a writing style that had become popular by the end of the 15th century with the educated class, including professional scribes, in southern Italy. Its heritage can be traced back to Niccolo de Niccoli, an Italian scholar of the early 15th century. De Niccoli started to oblique and add flourishes to his letters when he wished to write in a faster more relaxed fashion than usual. By mid-century, other scholars began to imitate his writing. In fact, the style came to be called “Cancelleresca” because of the preponderance of work produced in that type for city chancelleries. The cursive style of writing had been developed by the scholars and learned government officials who were the intended audience for Manutius’ books. Manutius commissioned typeface designer Francesco Griffo da Bologna to develop a cursive type for a new series of small books he was planning to produce. Typelore would have us believe that Manutius invented italic types as an economy, with the goal of saving space in his books. This would cut paper costs, bringing the books within the means of people who previously were unable to afford them. Economy, however, was not his motivation. By adapting the popular style to print, Manutius and Griffo hoped to make their books more appealing. The new books proved very successful – so successful in fact that other printers felt obliged to produce their own books in this new typestyle. The problem was that Manutius would not sell his new fonts to the competition. So Manutius’ contemporaries did what has become a common practice in the history of type design – they copied the designs they could not buy. Not wishing to call attention to their plagiarism, but still needing to give the new offering a name, Manutius’ competitors chose “italic,” after Italy, the country where it originated.